We noticed a mention of the wonderful Chateau Tour des Gendres in the latest edition of Wine Spectator. This month’s issue features an article on the food and wine of the Dordogne region. 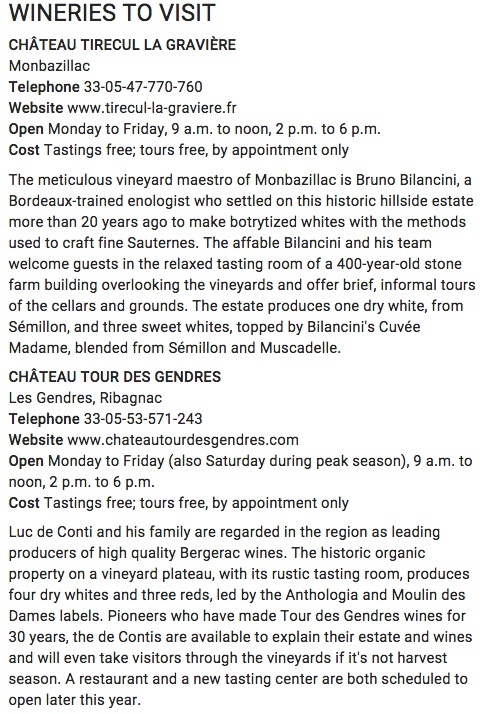 Chateau Tour des Gendres was listed as one of two wineries to visit. Luc de Conti is touted as one of France’s leading wine makers. He is at the forefront of organic production and a proponent of white wine production in Bergerac (which has historically focused on red wines). We have previously written about Luc and his wines. To read more click here including links to his delicious wines that we currently have in stock. If you are planning a trip to France, the Dordogne region and Chateau Tour des Gendres are certainly worth a visit!